Beach Head Desert War Game Review - Download and Play Free Version! Fast paced, realistic war action that will keep you glued to your screen! Here comes the enemy and you are hopelessly outnumbered...but they are the ones who should be worried! Load up an awesome array of weaponry and shoot your way out of wave after wave of ruthless enemy attacks. 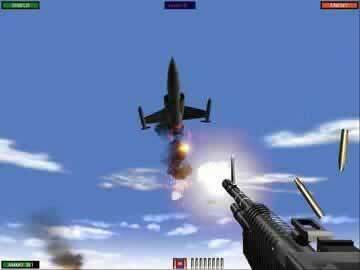 In each level, you will operate a different type of weapon from heat seeking missles to 50mm guns. As you fend off massive amounts of enemies, ammo will become critical. Watch for ammo drops from allied planes and shoot them to restock your munitions, you are going to need every last one. 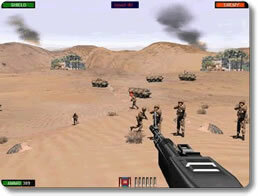 Beach Head Desert War is an engrossing, realistic, first-person shooter that war action enthusiasts will enjoy. Hope you make it back alive, soldier. Beach Head Desert War is an arcade-style shooter that provides some rather intense bunker defending action. Take your seat at the fixed gun emplacement and try to fend off waves of enemy soldiers, armor, and aircraft with limited ammo and only a handful of powerful weapons. At your disposal to beat back the enemy army are a variety of weapons including an M60 general purpose machine gun, a six-barrel Gatling gun, Anti-Aircraft machine gun, an Anti-Tank cannon, heat seeking missiles, a last ditch .45 hand gun, and even B-58 medium bomber air support. Although there is usually enough ammo to take on enemy forces in each mission, prioritizing targets gets more and more important as you reach later levels if you have any hope of surviving. With improved graphics full of vivid explosions and dust clouds from rocket blasts as well as a simple and easy-to-use interface, the gameplay draws you in and you can quickly get the hang of things within only a few minutes of play. 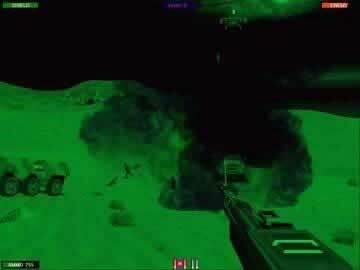 The addition of night levels and some twists in the variety of enemy forces that are thrown at you during a particular wave adds a little bit of variety to the action as well. Yet, the gameplay for the most part is exactly like that found in previous Beach Head titles. The levels get repetitive pretty early on and while the few slight variations might help to liven things up, they don't occur often enough. The hillsides and slight depression your bunker is situated in is pretty much exactly the same as previous titles with only some slight changes in textures to fit the Middle Eastern setting. There really isn't much of a story and the missions just run together with not a whole lot of an impetus to play through the game again other than to beat your previous high score. Overall, Beach Head Desert War does provide some mindless arcade-style shooting that can get intense at times. If you are any fan of the series then this title continues on with the same kind of bunker defense action, but doesn't provide many new twists. The intense action can get a bit frantic and it is fun to play, at least through the first couple of levels, and the rare level variations are quite enjoyable to experience. If you are any fan of arcade shooters then at the very least it would be a good idea to try out the demo and play through a few levels to see if this is the kind of action you're looking for.